As the sun comes out and the weather gets warmer, there’s one kind of exercise that comes front and center in my mind. It’s tennis. I started playing tennis when I was four years old, purple tennis racket and all. 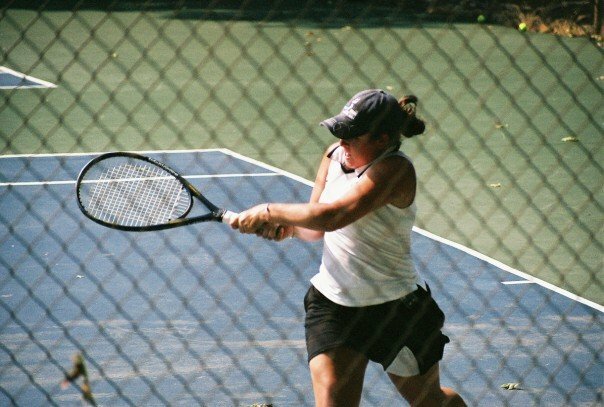 I do not get to play tennis nearly as much as I’d like, but that doesn’t diminish how I feel about it. Tennis takes two people, and I just haven’t found a lot of other people to play with (so if you’re in the area and want to play, let me know!) I played in high school and I played in college. I liked being an athlete, with a team full of friends there to support and encourage me. I remember in college we had a practice meet to get ready for our Spring “season.” We were a DIII team, and our season was against a DIA team, so we practiced against a DII team. If you don’t understand what I’m saying, we’re at the bottom of the pile, and our season opponent was at the top. I had gone low plenty of times while playing, and I’d wait for a court change to chug Gatorade or juice or tabs or take your pick. I was the only one allowed to not cut my gatorade (mix it with half water). I tested during this match, and I was in the 50s, I turned off my pump and I chugged some sugar. At the next court change I was 39. I had to make the decision to walk off the court. It is the only time in all the time I’ve been an athlete that I quit a match because of diabetes. I know that it was unsafe for me to continue, but it still holds a place in my heart & mind where I want to go back. Would it happen again knowing what I know now? Is there anything I could’ve done differently? Does anyone else have a moment where diabetes interfered? A moment that sticks out as much as this one does for me? And then there was Spalding HS match, when you had to stop mid game at the fence to chug your Juicy Juice box. Your doubles team made a huge turn around and you won the match. Even the opposing coach was impressed. A team mate’s comment of “I need some of that Juicy Juice, ” was appreciated by all. And both teams were shown what a low is and how it can affect you.